Chas. R. Mackintosh. Glasgow 1901. 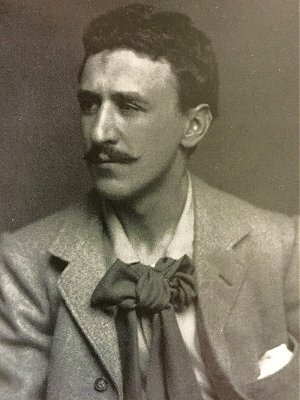 Charles Rennie Mackintosh the Scottish architect and designer born in Glasgow on the 7th June 1868, designed some of the most influential and important buildings, iconic furniture and complete decorative interior schemes of the early 20th century. His forward progressive modernity put him some twenty years ahead of the world, his early style has a strong modern edge with a subtle style of the Anglo-Japanese, no doubt inspired by Edward William Godwin who's own earlier architectural works were used in college curriculum's and architectural studies in the late Victorian period and around the turn of the century, coupled with the strong influences of Japan who's wares were flooding into and throughout Europe at a time while Mackintosh was growing up, it is here in these formative years, where his style begins to grow and flower, eventually maturing into a new style, yet drenched in tradition, sometimes radical and sometimes even a little spooky. His unique style a blend of elements from the Scottish vernacular and the English Arts and Crafts tradition laced with the organic forms of Art Nouveau were in his time not always accepted into the public eye. But his genius is undeniable, so much so that he even predicted Art Deco, long before it was in vogue. In 1884 he began an apprenticeship with John Hutchinson. In 1889 he became an architectural assistant with Honeyman and Keppie and also enrolled at the Glasgow School of Art where he met and developed an artistic relationship with Margaret MacDonald, her sister Frances Macdonald and Herbert McNair whom soon came to be known as "The Glasgow Four", or "The Spook School", the Four exhibited posters, furnishings, and a variety of highly individual designs in Glasgow, London, Vienna and Turin. These exhibitions helped establish Mackintosh's reputation. A gifted architect, interior designer and decorator, an exhibition designer, a designer of furniture, metalwork, textiles, stained glass, and a water colourist another gift he developed at Walbeswick in Suffolk England, (a stones throw from 'Puritan Values premises' here in Southwold). He continued painting water colour's in his latter years in France. He was a pioneer of the Modern Movement in Scotland, England and throughout Europe and C R Mackintosh's works exist as some of the greatest achievements of all time from the British Arts and Crafts Movement. He died in London in 1928.